Old School Muscle Building Tips From Vince Gironda. When I started bodybuilding, I tried many of Vince’s bodybuilding routines with great success. As a matter of fact, I remember waiting eagerly for the new Muscle Mag International magazine to come out every month just to read Vince Gironda’s column. Vince was a man with a vast amount of bodybuilding knowledge, and while I do not agree 100% with everything he had to say, one thing that I can guarantee you is that if you read something coming from Vince you will learn something practical that you can apply to your workouts with great results! In addition, many of his courses did get me past many plateaus that I was experiencing in my early years of bodybuilding. Here is one of the routines from Vince that gave me absolutely awesome results and I want to make sure that I share it with you. Try it out and let me know what you think! 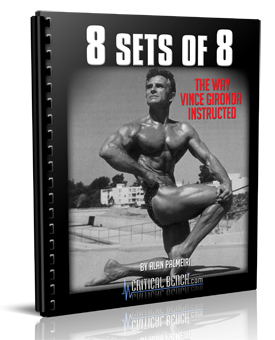 Are you ready to unleash some major muscle mass gains with Vince’s 8 sets of 8 routine? You will be amazed at the kind of routines that Vince is proposing here. Everything is spelled out for you (no guesswork) so that you can start on your path to NEW GAINS today! IMPORTANT: In order to read this book you must have Adobe Reader installed. If you do not have it installed, then go to www.adobe.com/reader and download it for FREE. Also, to download this book to your computer simply right click the link below (or the book graphic) and click “Save Target As”. Leave a Comment with Facebook for Old School Muscle Building Tips From Vince Gironda.